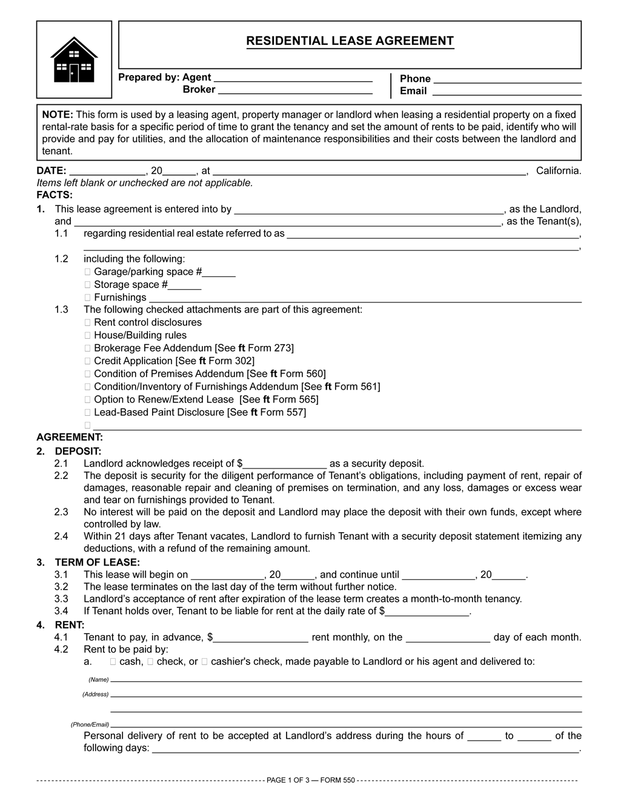 This form is used by a leasing agent, property manager or landlord when leasing a residential property on a fixed rental-rate basis for a specific period of time, to grant the tenancy and set the rents to be paid, identify who will pay which utilities, and allocate maintenance responsibilities between the landlord and tenant. RPI’s Residential Lease Agreement is a fixed-term lease agreement used by a leasing agent, property manager or landlord when leasing a residential property on a fixed rental-rate basis for a specific period of time, to grant the tenancy and set the terms for rent and conditions for maintenance. A landlord may not alter the terms of a lease agreement during the life of the lease without consideration and the tenant’s consent. Often, a residential tenant wants to remain in possession on expiration of their lease. The amount of rent a landlord may demand and receive to extend a lease is limited only by negotiations and economic forces existing in the local rental market. Landlord’s acceptance of rent after expiration of the lease term creates a month-to-month tenancy. Real Estate Property Management Chapter 51: Foreign-language residential leases. Real Estate Property Management Chapter 47: Lease renewal and extension options. Real Estate Property Management Chapter 24: Forfeiture of the lease. Thank you for your inquiry! Based on your comments, you are using the Internet Explorer web browser. Internet Explorer is no longer supported by Microsoft and is unable to download PDF files from this website. Please use a different web browser to freely download all forms and PDF files. The lease has an 18% rate written in for late payments. Isn’t that usurious? I’m guessing it’s not since it’s a fee, not an interest charge. Nice name.